According to a survey by Universum of 10,306 college graduates, about one in four want to work for Google. The 25% of this survey respondents that picked Google was nearly twice as the second ranked in the list – Apple. 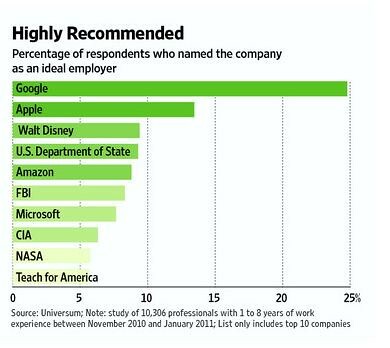 Walt Disney, the U.S. Dept of State and Amazon finished out the top five of the desired employers. Universum, a consulting firm for companies seeking prospective employees, asked the college graduates to pick a list of five desired employers from a list of 150. Young professionals generally want to work at companies that the professionals like as consumers. They also like those that seem financially strong and offer job stability. See the complete ranked list of companies here. Posted in Career and tagged Career, employers, Google, government jobs, jobs. Bookmark the permalink.